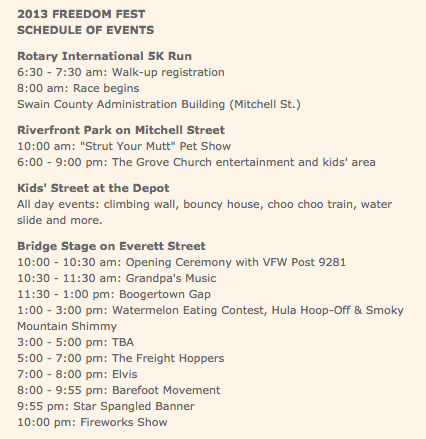 July 4th is quickly approaching on the calender, and if you are going to be in the Bryson City area around then that means gearing up for the largest street festival of the year! This festival is an all day long event filled with local music, artisan foods, hand-made crafts and jewelry, and much more. Bryson City shuts down the majority of Everett Street for the festival and the road is lined with tents full of fantastic items for the whole family. After the day has passed and the street vendors start to clear out a portion of the road stays closed until the fireworks show takes place around 10pm. There are many places around town that you can catch the fireworks from, but one of the best is right downtown from the Everett Street bridge. Come join us for an old fashioned street festival on the charming downtown streets of Bryson City. Our annual Fourth of July celebration begins with the Rotary Club Firecracker 5K, and then continues with local artisans and crafters, a full day of local entertainment, festival foods, and fun events including a watermelon eating contest and hula hoop off. Explore Kids’ Street where you’ll find a rock climbing wall, water slide, bouncy house & choo choo ride. Even Fido is not forgotten – enter your best friend in the “Strut Your Mutt” event that awards ribbons for categories such as “Best Tail Wag” and “Looks Most Like Owner”. Where else can you find “Elvis” as your emcee as well as performing some of his favorite songs? Actually there are 3 music stages – on the river, at the depot and on the bridge. 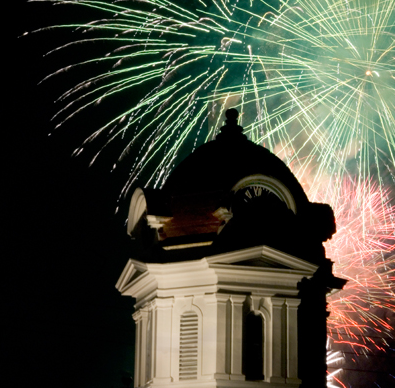 As the day wanes and the final band exits the stage, listen to The Star Spangled Banner as you view one of the most spectacular fireworks shows in the Smokies. We at Yellow Rose Realty would love to see you at our small town’s big celebration and if you are still looking for a place to stay we can help, just visit us a www.yellowroserealty.com or call (800)528-0760. See you soon! Previous PostNoteworthy Mountain Events in JuneNext PostCabin or Hotel?